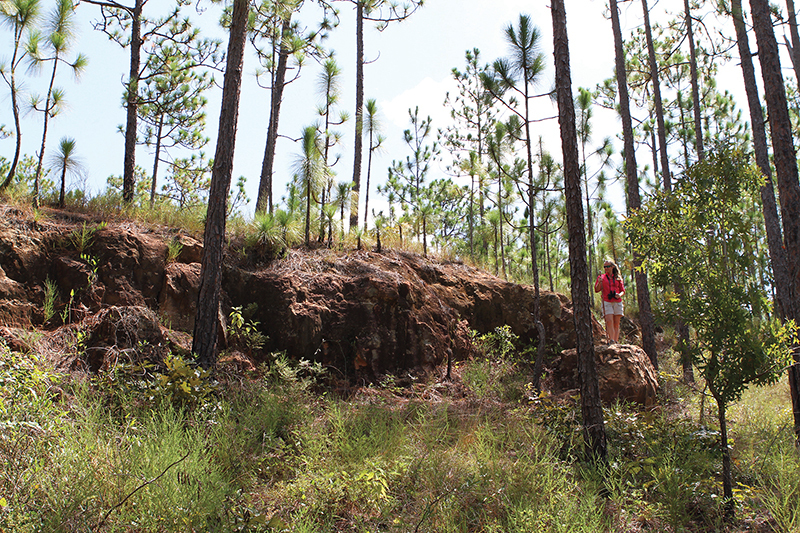 Rare in Florida, bluffs and gorges etch the landscape at Torreya State Park, along the Apalachicola River. An hour’s drive west of Tallahassee there’s a strange, mountainous world on the east bank of the Apalachicola River. It’s a land of rare plants, tall bluffs and steep gorges that’s full of natural and historical wonders. The Civilian Conservation Corps built Torreya State Park during the Great Depression. It was one of the original state parks built by the CCC in the 1930s. Florida Caverns State Park is another one, built by members of the same crew that built Torreya. The park derives its name from the rare coniferous Torreya tree first described by Hardy Bryan Croom back in the 1830s and named for an American botanist, Dr. John Torrey. This tree can only be found on the high bluffs overlooking the Apalachicola River. “The CCC built the park because of the unique environment here, and to preserve the rare Torreya tree,” said Kevin Keene, park ranger. The high bluffs provided a natural strategic location for Confederate cannon during the Civil War. The guns were positioned to defend against any Union vessels that might try to ascend the river to attack Columbus, an important industrial city at the time. The gun emplacements of the “Hammock Landing battery” are still visible and can be seen along the hiking trail below the Jason Gregory House, which was originally built in 1849 on a plantation across the river at Ocheesee Landing. After the war, the Gregory House fell into disrepair and was donated to the CCC in 1935. The CCC moved it piece by piece and reassembled it on the plateau where it currently affords incredible views of the river. The house, which is about 80 percent original, is filled with appropriate antique furniture and appointments and is open for tours. A replica of the home’s kitchen is separated by a breezeway from the house and serves as a visitor center and park office. Nature is perhaps the biggest attraction at the park. There are forests of hardwoods, towering pine trees and ancient magnolias. Flowering plants like jasmine, azalea and dogwood light up the trails during the spring. Wildlife is abundant; it’s estimated that 100 species frequent the park. There are also deer, bobcat, gray fox, beaver and the Barbour’s map turtle. A word of caution: Be mindful of alligators when hiking down to the river’s edge. In some places, the trails are steep and may not offer a quick or easy egress in case of such an encounter, so keep your eyes open. There are about 16 miles of arduous hiking trails available for hiking and primitive camping. There are two main trail loops, 30 campsites with electricity and water, and three primitive sites, each with four spots. Day hikes and overnight hikes are permitted, but Keene said “primitive” means you have to backpack in to the site from a trailhead. There are also two youth camp areas that can accommodate between 20 and 40 people. Picnic pavilions can be reserved for large parties, but are ordinarily first-come, first-served. Naturally, the park’s busy seasons are spring and fall, when the weather is coolest. Civil War re-enactors stage a living history encampment the first Saturday in February. Summertime is naturally buggy and hot, but holiday weekends in the hot months are always busy, Keene said. Torreya State Park is located 13 miles north of Bristol off State Road 12 on County Road 1641. For more information, call (850) 643-2674. Hours are 8 a.m. to sunset, year-round.